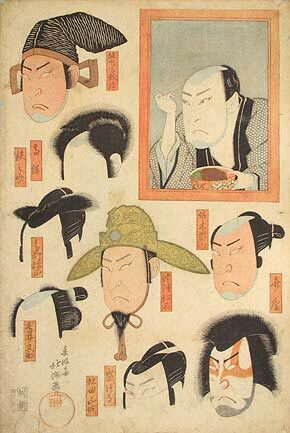 Hairstyles in Edo-period (1600-1867) Japan were as rigidly prescribed as clothing and house size, and like everything else under the Shogunate, how the hairs could be arranged on your head depended on your social class. On the street as in the battlefield, a samurai's head had to be shaved from the forehead back in a circular pattern (originally designed to make life more comfortable with a helmet) with the side and back hair brought back in a topknot. A few variations of this sakayaki styling became acceptable over time — several centuries of peace can help to loosen restrictions, after all — but highly individual idiosyncrasies were out of the question. Given these restrictions, it should come as no surprise to learn that the kabuki theatre delighted its audience — the old forbidden fruit syndrome — by crowning its characters with all manner of weird and exotic coiffures ... in the form, of course, of wigs. On stage, thanks to inventive wigmakers, warriors could appear with frizzy shags or sleek manes, and rogue outcasts might have their hair standing on end or falling down the back like rock stars. When combined with the phantasmagoria of kabuki make-up, plus the odd cloth or lacquer headgear to top it all off, the potential for a pate to project bravura and intensity grew in bounds. Only the women in the audience had the liberty to borrow hair fashion ideas from the stage — more precisely, from the female impersonators (onnagata) playing courtesans and other heroines — but townsmen could at least revel in what they saw. Hairstyle as exciting stagecraft, hairstyle expressing (ask any adolescent) social dissatisfaction. Certain styles of wigs became synonymous with specific character roles, just as did a particular pattern of kimono or unusual prop. Likewise, an actor strongly associated with such a role could be conjured up in full costume and demeanor by simply gazing at the trademark wig. Thus evolved the kind of print illustrated here, a wig print or katsura-e. Along with costume cut-out prints, mitate prints (fictitious performances with allusive associations), and displays of actor crests, katsura-e were one of the numerous means by which kabuki fans could flex their imaginations while collecting ukiyo-e of their idols. Conceived as a tribute to a supremely versatile actor of the highest calibre, katsura-e represented a distinct rarity in Osaka, compared to Edo. That said, the piece illustrated here is from a set of five from 1821 by the Osaka artist Hokushû (active 1810-32). The set (featuring 40 wigs in all!) honors Arashi Kichisaburo II, the longtime superstar darling of the Osaka stage. Acting exclusively in the Osaka area since 1787, Kichisaburo (b. 1769) changed his name to Kitsusaburo I in 1/1821. At the same time, he announced a truce with his arch-rival, Utaemon III, and was set to appear together with him on stage, the ultimate dream of every Osaka kabuki fan. Alas, Kitsusaburo took ill soon after his name-change, and died in 9/1821 with the dream unfulfilled. Sharp-eyed readers will note the absence of female wigs. This is because, all-round performer though he was, Kichisaburo did not take on onnagata roles. However, the more pedestrian wig designs in the set have as many as five role names written alongside them, a testament to both the encyclopedic career of this actor … and the limits of wigmaker ingenuity. Particularly noteworthy roles, such as Benkei, in the lower right corner, feature Kichisaburo's face and make-up as well as the wig. Also of interest is the inset showing Kichisaburo at his dressing room mirror. The five sheets of the set show a progression from the actor just sitting down, calmly smoking a pipe, to the point where not only is his face made up, but he has already assumed one of the mie (intense stares) demanded by that day’s role. The sheet illustrated here, with three hues of make-up in the Imari bowl, falls into this sequence as #4. This article originally appeared in Daruma, no. 42, Spring 2004. Copyrighted © text and pictures reprinted with permission.